0.0.0.0.1 The reason behind the huge success of Asus Zenfone Max Pro is Stock Android and Guaranteed Security updates. Most of the Android Users love to have a minimal interface and pure android experience. So, recently Asus started to roll out it’s August Security Update for Asus Zenfone Max Pro M1 with some interesting features. 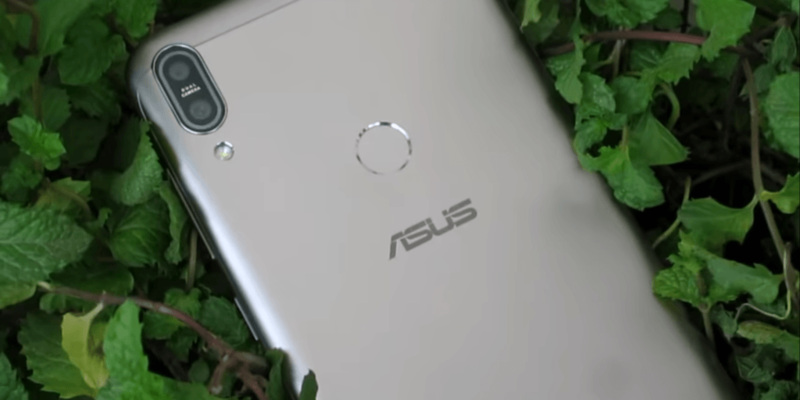 0.0.0.0.2 Asus has started selling the ZenFone Max Pro M1 6GB RAM variant in India while the 3GB RAM version of the ZenFone Max Pro M1 comes with a price tag of Rs. 10,999, its top-end 6GB RAM model is priced at Rs. 14,999. The smartphone competes against the likes of the Redmi Note 5 Pro. The ZenFone Max Pro M1 has 32GB and 64GB of onboard storage options that both are expandable via microSD card (up to 2TB). The smartphone has 4G LTE, Wi-Fi 802.11 a/b/g/n with Wi-Fi Direct, Bluetooth v4.2, GPS/ A-GPS, GLONASS, Micro-USB, and a 3.5mm headphone jack. It also includes a fingerprint sensor at the back. Besides, there is a 5,000mAh battery that supports 10W charging. 1.0.0.0.1 The latest software update for the Max Pro M1, version WW-15.2016.1808, is a small update. Asus is rolling out to users in phases, so it could take a while for all the devices to get the update. 2.0.0.0.1 Apart from these features, the phone also has a rear-mounted fingerprint sensor, Face Unlock, Dual 4G VoLTE, Dedicated Micro SD Slot stock Android 8.1 Oreo out of the box, which is great. The reason behind the huge success of Asus Zenfone Max Pro is Stock Android and Guaranteed Security updates. Most of the Android Users love to have a minimal interface and pure android experience. So, recently Asus started to roll out it’s August Security Update for Asus Zenfone Max Pro M1 with some interesting features. 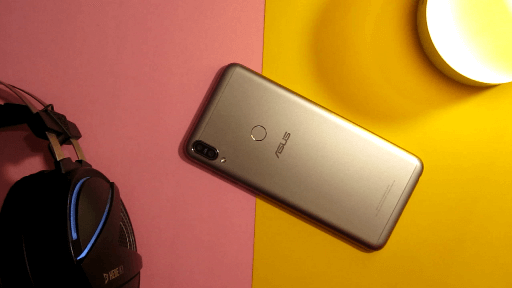 Asus has started selling the ZenFone Max Pro M1 6GB RAM variant in India while the 3GB RAM version of the ZenFone Max Pro M1 comes with a price tag of Rs. 10,999, its top-end 6GB RAM model is priced at Rs. 14,999. The smartphone competes against the likes of the Redmi Note 5 Pro. The ZenFone Max Pro M1 has 32GB and 64GB of onboard storage options that both are expandable via microSD card (up to 2TB). 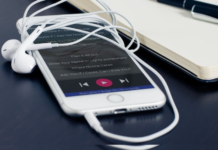 The smartphone has 4G LTE, Wi-Fi 802.11 a/b/g/n with Wi-Fi Direct, Bluetooth v4.2, GPS/ A-GPS, GLONASS, Micro-USB, and a 3.5mm headphone jack. It also includes a fingerprint sensor at the back. Besides, there is a 5,000mAh battery that supports 10W charging. The latest software update for the Max Pro M1, version WW-15.2016.1808, is a small update. Asus is rolling out to users in phases, so it could take a while for all the devices to get the update. 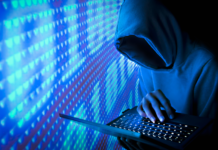 The update brings some new features and installs the August Android security patch. 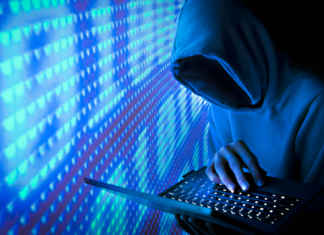 This makes your device more secure for malware and vulnerabilities. You also get improvements to the NFC functionality on the phone. Apps such as Google Pay will now work better thanks to the changes. 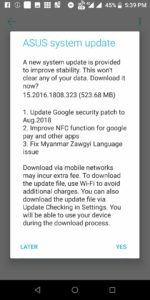 Apart from that, the update also fixes an issue with the Myanmar Zawgyi Language. Before installing the update, make sure your device is on a stable Wi-Fi network and has more than a 50 percent charge. Although this is an OTA update, it weighs 1.5GB. If you haven’t received the update, you can manually go to Settings > System > System Update, and check for it. Asus used to sell this phone in India using the Flash sale model, on Flipkart. Starting this month though, the phone went on open sale. It is available in three variants in the Indian market. The base variant, which comes with 3GB of RAM and 32GB of storage, is available for Rs. 10,999. The 4GB RAM/64GB variant costs Rs. 12,999, and the 6GB RAM/64GB variant costs Rs. 14,999. The phone comes with a 5.99-inch Full HD+ LCD display, which has an aspect ratio of 18:9. 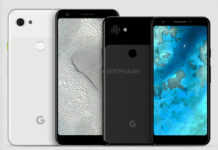 There is no notch or anything, and the phone has a good amount of bezels on the top and bottom of the display. The phone uses a metal construction, giving it a nice premium look. It is equipped with the Qualcomm Snapdragon 636 processor, and the Adreno 509 GPU. This is a great mid-range chipset, and a lot of smartphones in this price range is using this chipset. You can play all the high-end games on it, which is quite efficient. Talking about the battery life, which is not a problem for the Zenfone Max Pro M1, as it features a large 5000mAh battery. In the camera department, there are slight differences between the base and the top variants of the phone. The 3GB and 4GB RAM variants of the Max Pro M1 come with a 13MP+5MP setup at the back and an 8MP front camera. The more powerful 6GB RAM variant has a 16MP+5MP rear camera setup and a larger 16MP sensor up front. Apart from these features, the phone also has a rear-mounted fingerprint sensor, Face Unlock, Dual 4G VoLTE, Dedicated Micro SD Slot stock Android 8.1 Oreo out of the box, which is great.